The lighthouses of the Peninsula are favorite visitor stops both winter and summer. These historic lighthouses are two of 750 guarding the shores of the United States. Completed in 1856, the Cape Disappointment Lighthouse guides sailors into the mouth of the Columbia River. The century-old North Head Lighthouse, completed in 1898, guides mariners approaching from the north. Both lighthouses were taken under the jurisdiction of the U.S. Coast Guard in 1939. 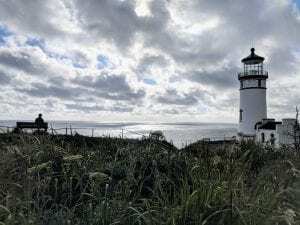 The lighthouse is now maintained by Washington State Parks and is currently undergoing a fascinating restoration process with help from the Keepers of the North Head Lighthouse. Before there were lighthouses on the Peninsula, ships bound for Portland and Astoria navigated their way through the high waves and shifting sandbars, focusing on fluttering white flags and notched trees along the shoreline by day and flickering signal fires by night. These methods were crude at best and, despite heroic efforts, the sea offshore the Long Beach Peninsula became known as The Graveyard of the Pacific. The North Head Lighthouse was built in response to a marked increase in the number of shipwrecks along the Peninsula as mariners coming from the north could not see the Cape Disappointment light. The 65-foot North Head Lighthouse was designed by German-born engineer C.W. Leick and sits on solid basalt more than 190 feet above sea level. 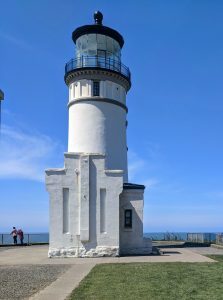 It first used the hand-me-down, first-order Fresnel lens from Cape D, switching to searchlight and finally beacon light at the same time changes were made to her sister lighthouse. A fresh coat of paint just in time for her century birthday restored the North Head’s masonry to marine white with a red cap. The lighthouse has since been returned to its original black cap with major restoration efforts underway. A Lighthouse Keepers Residence is just inland from the North Head Lighthouse. Now offered as a vacation rental through Cape Disappointment State Park, the residence housed a number of families over the years. There were three lighthouse keepers, each working an eight-hour shift to provide 24-hour coverage and ensure the light remained visible. The United States Lighthouse Service was run with military exactness. 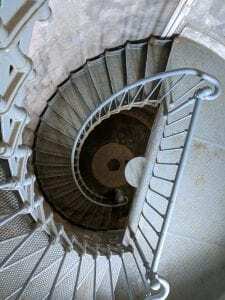 For example, to reflect the lighthouse keepers’ hierarchy, the chandelier in the head keeper’s residence had six candles, while the first and second assistants had five and four candles respectively. The keepers were also required to wash laundry on a certain day and received demerits if sheets were hung to dry on a wrong day. They carried 30 pounds of kerosene up the stairs, trimmed the wicks, and cleaned the lens (the most time-consuming task). Lighthouse keepers cleaned off soot and burnt oil from the lens with rags or pieces of softwood, used wine to clean the entire lens every 60 days, and polished it with a jeweler’s rouge once a year. When not manning the light, keepers could read books from the portable library, including a new Bible and prayer book issued every quarter. Women played a variety of interesting parts in the history of the lighthouses. Many wives cared for residential households and one woman, Mabel Bretherton, served as a lighthouse keeper for many years until her resignation in 1907. North Head is the windiest lighthouse area on the West Coast and the second windiest in the nation. Winds of 120 miles per hour have been recorded at the site. One dramatic tale tells of a head keeper’s wife who was “unable to bear the howling of the winds” and flung herself off the cliff into Beard’s Hollow. Another story tells of a duck that blew off course in 1932 and crashed through the lighthouse window, chipping the lens. The North Head Lighthouse is currently closed for tours. Hear the history of this wonderful century-old lighthouse as you make the trip to the top. Enjoy the breathtaking panoramic view of the Peninsula and the Pacific Ocean from the second windiest spot in North America. The lighthouse grounds are open at no charge, year-round, dawn until dusk. Call (360) 642-3078 for details just before your visit. Call for tour hours, which change seasonally. $2.50/person. Restrictions: Children must be 7 years or older to climb the lighthouse. No flipflops.